Another movie based on a true story, The Imitation Game tells a fascinating story of brilliant minds deducing methods to break Germany’s unbreakable Enigma cryptography code during World War II. The genius of Alan Turing (Benedict Cumberbatch) causes him to be a bit of an egotist. He knows how smart he is and he flaunts it: first, with Commander Denniston (Charles Dance) at the UK’s secret code-breaking agency; later, with his co-workers who have a hard time liking the guy. Intercepting the Germans’ encrypted messages was easy. The mission to break the constantly changing code was deemed impossible. But Turing and his team made it happen. They required patience and a major outlay of funds from the government to finance the project. With Winston Churchill’s support, they got the money. The result was an early, primitive version of a modern day computer. The team battles a series of frustrations. In the film, when they are able to finally break the code, they can’t share the info they obtain. Their fear that the Germans would quickly realize that the Allies know their plans might compromise the whole mission. Ultimately, the breaking of the code was credited with saving millions of lives. Keira Knightley appears as Turing’s friend Joan Clarke, a fellow code breaker. Her character’s significance is said to be inflated a bit in the film, but Knightley provides box office appeal and a feminine presence in a male-dominated movie. The story of Alan Turing and his work is one that has not been widely told while many have been familiar with Hawking for decades. Benedict Cumberbatch is a certain best actor nominee and The Imitation Game is a likely best picture nominee. The film is directed by Norway native Morten Tyldum. The Imitation Game is one of 2014’s best films and one that I recommend highly. Into The Woods is a pure delight. The performances are fun and funny. And what a cast! Wonderful Stephen Sondheim songs bring together characters from favorite fairy tales. (The script is by James Lapine.) The songs have clever lyrics that you can understand. The songs have those Sondheim melodies that don’t always go where you expect them to go. The story begins with The Baker (James Corden) and his wife (Emily Blunt) who want a baby. The witch (Meryl Streep) says she will lift her curse on the baker’s family if the couple accomplish three specific tasks. They must go into the woods to get things done. The large cast of characters also includes Little Red Riding Hood (Lilla Crawford), The Wolf (Johnny Depp), Cinderella (Anna Kendrick), Cinderella’s Stepmother (Christine Baranski), The Prince (Chris Pine), Jack (Daniel Huttlestone), Jack’s mother (Tracy Ullman), The Giant (Francis La Tour), Rapunzel (Mackenzie Mauzy) and more. The story that weaves all these characters together is ingenious. Though these are children’s stories, the movie is made for adults. Disney toned down some of the more grownup content from the stage version of Into The Woods to make the film more family friendly. Yes, you can take your kids—it’s rated PG—but younger children are likely to become fatigued. The film’s strongest performances come from Meryl Streep, Emily Blunt and (surprise) Chris Pine. On the down side, the movie seems longer than it is. Run time is 2 hours, 4 minutes. Resolving multiple story lines takes a while. The pace of the film, just perfect at the start, seems to bog down a bit in the end. But there are joys aplenty in Into The Woods. If you like musicals, you need to experience and enjoy it. Unbroken tells an amazing true life story of a real man, Louis Zamperini. Director Angelina Jolie’s film has flaws but still manages to bring Zamperini to life impressively. He is played by Jack O’Connell, an Irishman, who does a credible job portraying this 2nd generation Italian-American. Like the young Zamperini, O’Connell is classically handsome. Zamperini is a track star who makes it to the 1936 Berlin Olympics. During World War II his plane is shot down in the Pacific. He survives 47 days at sea. He is rescued by the Japanese who imprison him. During his imprisonment, he is teased, tortured and abused by a Japanese officer he nicknames Bird. Zamperini’s physical and mental toughness inspires the other prisoners and gains him a small amount of respect from his captors. Then, the war ends. Among the film’s flaws is the strange beard growth (or lack of it) by men stranded at sea for 7 weeks and by men in prison camps. Much of the time in life rafts was less realistic than one would expect from a modern film—it appears many scenes were shot in a tank or pool, not so perilous as being adrift in the ocean. Jolie and scriptwriters Ethan and Joel Coen have a lot of story to cram into a 2-hour movie. They do an admirable job of presenting Zamperini’s life highlights and lowlights and imparting an appreciation of the man’s character. The film is based on Lauren Hillenbrand’s best-selling book which, according to synopses I’ve read, contained more light-hearted moments that helped Zamperini survive prison camp. Unbroken was an early frontrunner for awards nominations. Now that the film has been widely previewed, the buzz has diminished. Still, Zamperini’s story has enough moments to make you admire this man who you may have never heard of. Unbroken is also constructed to provoke a bit of old-fashioned American pride. And it does! 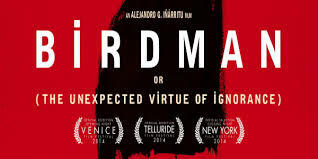 Birdman. Creativity unleashed. A fantastic story with a memorable lead character who elicits a variety of responses from his incredibly strong cast as well as from audience members. And what an ending! Excellent use of the film medium. Boyhood. Richard Linklater’s idea of telling the story of a young man growing up, using the same actor from start to finish, was risky. So many things could have gone wrong, but, based on what is on the screen, they mostly went right. Ellar Coltrane was a perfect choice for the lead role. The Grand Budapest Hotel. Wes Anderson’s masterpiece is zany, madcap, silly fun. Anderson’s attention to little details and inspired performances from a large cast of stars make this his best yet. Whiplash. The concept doesn’t sound that exciting: a music instructor who’s an abusive bully meets up with a cocky young drummer. But the story, the music and the over-the-top character that J.K. Simmons inhabits combine for a movie that sizzles. The Lego Movie. Filled with fun and surprises. This film doesn’t just use Lego pieces as characters, it captures the way kids use Legos. The live action postscript was a beautiful touch. Snowpiercer. Praise begins with love for the French guys who did the graphic novel. And to the publisher who chose to sell the book in Korea, where the director/co-writer discovered it. Strong multinational cast. Dystopian class warfare at its best. Gone Girl. Everything works here. Acting, directing, scriptwriting. The most meaningful soundtrack of the year. Gone Girl satisfies on so many levels. Thanks to (most) everybody who resisted spoiling. The Theory of Everything. A British genius tries to channel his immense brilliance into something useful, while dealing with a challenge that could torpedo his efforts. For Stephen Hawking, it’s ALS. Multiple Oscar noms on the way for this one. The Imitation Game. A British genius tries to channel his immense brilliance into something useful, while dealing with a challenge that could torpedo his efforts. For Alan Turing, it’s closeted homosexuality—a crime in the UK in the 40s. Cumberbatch shows again why he’s the “go to” guy for so many movie makers. Nightcrawler. Jake Gyllenhaal is, as they say, a revelation as a free-lance videographer who crawls throughout the underbelly of L.A. for sleazy TV news footage. His story is well-crafted and his performance is maybe his finest ever. Guardians of the Galaxy. Characters, soundtrack, story, effects—wow! Chef. Beautiful food, wonderful music. And it gets social media right. Thank you, Jon Favreau! Big Hero 6. Appealed to my inner 12-year-old boy. I loved lovable robot Baymax and the film’s cool blending of U.S. and Japanese culture. St. Vincent. Bill Murray is loathsome, pathetic, hilarious, generous and sweet all in one movie. Good supporting cast, especially the kid. Life Itself. The talented Mr. Ebert had a wonderful life. Glen Campbell: I’ll Be Me. I met Glen Campbell and am a longtime fan. His good humor in dealing with Alzheimer’s plus the love shown by all his family was what made me feel good. Edge Of Tomorrow. The structure of this movie, similar to Groundhog Day, could’ve come off as dumb. Happily, it’s clever and fun. Draft Day. As an NFL fan, I enjoyed the football parts of the movie. The flyover shots of the stadiums were beautiful. Into The Woods. Sondheim songs and a mighty cast. A pure delight. The acting in Foxcatcher is excellent. The characters are intriguing. The story, however, is unexciting. Based on true events, set in the 1980s, Foxcatcher is mainly about one man and his quirks. Okay, two men with quirks. John Du Pont (Steve Carell) is a self-described “rich guy” who is obsessed with wrestling. (Legitimate wrestling, not the WWE type.) He is an heir to the vast Du Pont fortune. He resides on an estate in the Philadelphia suburb of Newtown Square. He recruits Olympic gold medalist Mark Schultz (Channing Tatum) to train at his estate. Du Pont’s relationship with Schultz goes beyond being a patron. He presents Schultz almost as a trophy. “Have you ever met an Olympic gold medalist?” he asks associates at a banquet. Du Pont soon convinces Mark’s brother Dave Schultz (Mark Ruffalo) to bring his wife and family and help coach the Olympic wrestling team at Foxcatcher Farms. Du Pont has issues, as many rich people do. He got his wealth the old-fashioned way… he inherited it. He tries to convince his mother (Vanessa Redgrave, in a brief but powerful appearance) that he’s doing something worthwhile. He also sees his role in leading the team to victory as his legacy, a service he’s providing the country. Mark Schultz also has issues. He’s been in his brother’s shadow most of his life. He’s not particularly bright or socially adept. And he does not handle failure well. This odd dynamic generates events that lead to a tragic end. Steve Carell, with prosthetic nose and stunt teeth, is terrific as Du Pont. (His portrayal generated early awards buzz which seems to have cooled lately.) Channing Tatum is a perfect dumb jock—his posture and his gait are dead on. Ruffalo is also strong as the loving, protective big brother. The narrative leaves much to be desired, but the acting here is superb. Unless you’re a wrestling fan, it’s the performances of the three main actors that provide the reasons to see Foxcatcher. Let’s get this out of the way up front. The Hobbit: The Battle of The Five Armies is not at good as the first 2 Hobbit films. But it provides much to enjoy and, as it’s the end of the trilogy, it delivers resolution. 2012’s The Hobbit: An Unexpected Journey had a wonderful bit of light-hearted fun as the dwarves engaged Bilbo Baggins (Martin Freeman) to be their burglar. The mix of hilarity and peril was in perfect balance. The scene with Bilbo and Gollum (Andy Serkis) trading riddles is classic. Director Peter Jackson created a film that was beautiful to look at and set the table for further adventures. 2013’s The Hobbit: The Desolation of Smaug ramped up the peril and introduced new characters, including the fearsome dragon Smaug (voiced by Benedict Cumberbatch). Tauriel (Evangeline Lilly) and Legolas (Oliver Bloom) are brought aboard to provide eye candy. And the Laketown village was visually stunning. The start of The Hobbit: The Battle of the Five Armies brings Smaug out of his cave to attack the Laketown village with fire and taunts. Without spoiling, I’ll just say that the dragon is decisively neutralized. The film’s main course is battles aplenty. But there’s a problem: when all the various factions face off, you can’t always tell who are the good guys and who are the bad guys. It’s like in Syria, where so many factions are trying to gain traction. But, as in Syria where everybody opposes ISIS, so too in Hobbit III, everybody hates this one particular group of Orcs. The final showdown up on the mountain involves several fierce one-on-one hand-to-hand battles. It’s classic, violent, enthralling stuff that provides the film’s real soul. Afterward, Bilbo and Gandolph (Ian McKellan) hoof it back home where the locals are busy auctioning off Bilbo’s goods, presuming him dead. A brief coda flashes forward and provides a satisfying conclusion for the hobbit, setting him up for what’s to come in the Lord of the Rings trilogy. One could argue that lengthy battle scenes with director Jackson’s terrific effects are what the audience wants. And one could reasonably argue that it’s appropriate for the Hobbit films to get progressively darker. But I still like the first 2 better. A thousand mile walk is long and tedious. So is Wild. Cheryl Strayed (Reese Witherspoon) sets out to hike the Pacific Crest Trail, which runs from the Mexican border to the Canadian border. She spends three months on the trail, covering 1,100 miles, to reset her life. Cheryl’s issues are examined in numerous flashbacks. The scenery is gorgeous. From the sparse vegetation and rattlesnakes of the desert to the verdant woodlands and foxes of the mountains, Wild gloriously displays the beauty of nature. Director Jean-Marc Vallée contrasts the peace and serenity of the trail to the tumult and pain of Cheryl’s personal life. Her father was abusive. Her mother (Laura Dern) left her husband, took her 2 kids and raised them to embrace the joys of life, no matter the circumstances. When Cheryl’s mother dies from a fast-moving cancer, Cheryl’s personal problems intensify. She becomes promiscuous and shoots heroin. Cheryl and husband Paul (Thomas Sadoski) try to work through her infidelities. Although they have split, he sends her supplies along the hike and offers encouragement. Reese Witherspoon lets down her vanity and lets viewers see her raw with no makeup (and in the raw in some of the scenes of her downward spiral before the hike. Although she brings condoms galore in her backpack, in the film she only has one hookup along way.) Reese’s Cheryl goes from a clueless rube as she begins her odyssey to a seasoned, more confident woodsman as she reaches Washington state. An emotional conversation with a young child she meets on the trail near the journey’s end is designed to trigger audience tears. Call me insensitive, but I was way more interested in the trek and the people and situations she encounters along the trail than I was in Cheryl’s backstory. Watching a novice hiker take on this immense challenge is, for me, a chance to live vicariously on a long-distance hike that I will never have the time or energy to do. Exodus: Gods and Kings is an epic film. It is epic like the epics of old from David Lean and C.B. DeMille. And like modern day epics from James Cameron and, well, Ridley Scott (director of E:GAK). Which is to say, Exodus Gods and Kings is big, bold and ambitious. The settings and the vistas are magnificent. In the old days, an epic’s trailer would mention “a cast of thousands.” In modern filmmaking, thousands of humans are not actually required to be on hand, but the shots of huge slave villages and giant projects (such as the Pyramids) provide a realistic looking depiction of what life may have been like way back in the B.C. day. In Exodus: Gods and Kings, Moses learns of his true lineage and, after several years away from the center of Hebrew servitude to the Egyptians, returns to set his people free. Moses goes into the mountains to talk to God. The Burning Bush is there, but the voice of God is represented by a young child (Issac Andrews) whose messages to Moses are sometimes delivered rather sternly. The kid does a great job. How to convince pharaoh Ramesses (Joel Edgerton) to free the slaves? How about a series of plagues? 3-D embellishes the horror of the plagues, which range from locusts to flies to frogs to boils on skins. The final plague, death of a family’s firstborn, does the trick. The exodus of the Jews climaxes with their pause at the shore of the Red Sea. Bale’s Moses and Scott do the trick of ensuring safe passage a bit differently from Charlton Heston’s Moses and DeMille. Bale is excellent as Moses, strong but not overbearing. Edgerton seems a bit uncomfortable as Ramesses. The Egyptian style which has men encircling their eyes in eye shadow makes him look feminine, which I don’t think is the intended effect. Also in the film’s cast are Ben Kingsley, Aaron Paul, Sigourney Weaver and John Turturro. Exodus: Gods and Kings runs 2:23 from the opening Fox logo to director Ridley Scott’s touching dedication of the movie to his brother Tony Scott, also a film director, who committed suicide in 2012. Ever had a mentor who pushed you too hard to succeed? Terence Fletcher (J.K. Simmons) is a music teacher who abuses his students, especially Andrew (Miles Teller) in Whiplash. The drums prodigy has made it to the fictional Schaeffer Music Conservatory in hopes of being the next Buddy Rich. Andrew has a bit of swagger. He’s filled with confidence and ambition. Writer/director Damien Chazelle has created two memorable characters. The performances of both actors are award-worthy, but both should be grateful for such powerful roles. Look for Chazelle to be mentioned, too, when nominations are announced. Although other students tell Andrew that Fletcher’s “bark is worse than his bite,” the pressure to perform up to his teacher’s tough standards is difficult. An incident leads Andrew to confront Fletcher physically. The fallout from the encounter affects both men. The film’s final act is a genius piece of storytelling and a wonderful bit of filmmaking. The conflict between Fletcher and Andrew drives the ending of Whiplash to an unexpected conclusion. The music performances in Whiplash are entertaining and are presented with great shot variety. Miles Teller does a good job convincing us that he’s a talented drummer. A hat tip goes to Paul Reiser who plays Andrew’s dad. Whiplash is one of my favorite movies of 2014. I think you’ll be hearing more about this one as awards season swings into gear.